The Queen has undergone surgery twice in 2003, but despite her visits to hospital she has maintained a full programme of state duties including hosting President George W Bush's trip to Great Britain and presiding over the Commonwealth Heads of Government Meeting in Nigeria. At a personal level her year was brightened by the birth of her seventh grandchild, Louise. 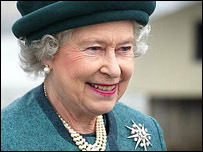 Due to restrictions imposed by Buckingham Palace it is no longer possible to view the Queen's Christmas Message for 2003. However you can read the text of the message elsewhere on BBC News Online.